Martin Curley, Chair of the EU Open Innovation and Stategy Policy Group, has identified Ireland’s lack of information technology subjects at secondary school level as a ‘big gap’ that will likely hinder Ireland’s workforce, as we move towards an increasingly knowledge-based economy. Speaking at the Industry Research & Development Group’s (IRDG) annual conference, “Leading Innovation for Business Growth”, in Croke Park today (Tuesday, October 24th), Curley said: “Our skilled labour force must continue to be viewed as a reason for companies to locate here. That requires the education system to reflect the skills needed to succeed in a knowledge-based economy. The lack of an information technology subject in secondary education continues to be a big gap. The world is digitising quickly and despite great teachers, our education system is not keeping up, meaning our future work force is at risk of falling behind the curve.” he said. However, Curley, who is also Professor of Innovation at NUI Maynooth and Senior VP, Global Digital Practice Lead at MasterCard, went on to say that Ireland is still punching above its weight in certain areas. “Compared to other European countries, Ireland has a larger share of high and medium high-tech manufacturing, a higher number of top R&D spending companies and a higher average R&D spend by these companies,” he said. Recently Ireland was reclassified from an innovation follower to a strong innovator in the European Innovation Scoreboard, “but we must equip our young people with the skills they will need if they are to keep up with these disruptive technologies,” said Curley. The IRDG conference is Ireland’s largest cross-sectoral meeting on Innovation, bringing together 300 businesses across life-sciences, tech, food, engineering, construction and financial services to discuss the challenges and opportunities faced by today’s business leaders. The IRDG is an industry-led organisation founded in 1992 to represent manufacturing and services companies involved in Research, Development & Innovation. Nine of its founding members were presented with Innovation Recognition Awards by IRDG Chairperson & CEO of Bimeda Holdings, Donal Tierney. They include Diageo, Glen Dimplex, Kerry Group, Moog, Henkel, Bord na Mona, Stryker, Bimeda & Analog Devices. “Todays Leading Innovation conference celebrates 25 years of IRDG supporting Irish companies developing new and improved products, processes and services. Looking to the future the conference focusses on how technology, human values and business come together to disrupt markets and drive real innovation within successful companies. We have some of the most inspiring Irish and European innovation leaders sharing their experiences with a diverse business audience. 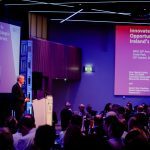 A real practical day which will have people highly motivated to drive innovation within their own businesses.” said Denis Hayes, Managing Director at IRDG.